Friends of the Indian King Tavern Museum invite you to an 18th Century Sewing Bee. Miss Amanda and her friends will construct an 18th century lady’s down. Watch as they cut, pin and starch the garment, using 18th century methods and techniques. Be sure to stop by the museum often on that Saturday to check on their progress. 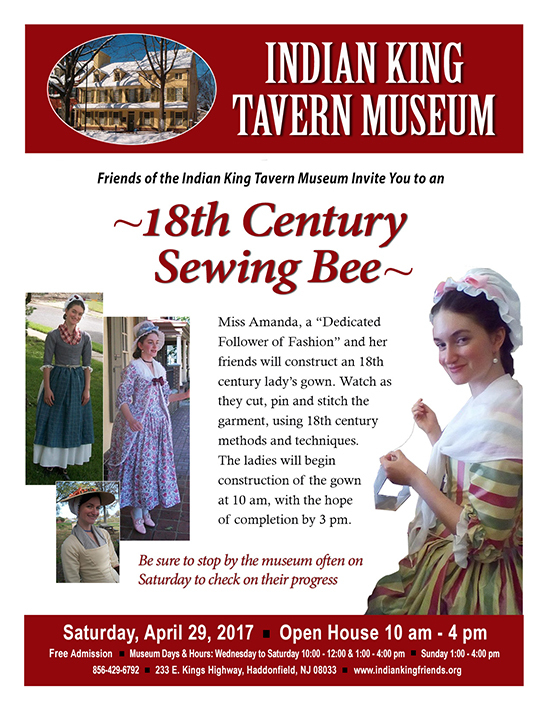 Friends of the Indian King Tavern Museum invite you to an 18th Century Sewing Bee. Miss Amanda and her friends will construct an 18th century lady’s down. Watch as they cut, pin and starch the garment, using 18th century methods and techniques. Be sure to stop by the museum often on that Saturday to check on their progress.